Today was my second day being a yarn hopper. I am participating in this year's Peninsula To Pier LYS (Local Yarn Shop) Shop Hop. I am part of the Santa Clara County Crochet Group on Meetup.com and Lynne (left) and Britt (center) are fellow knitters/crocheters. Britt spearheaded the wonderful crocheted diaper bag project. In the last two days, we have visited 12 yarn shops to get out "passports" stamped. 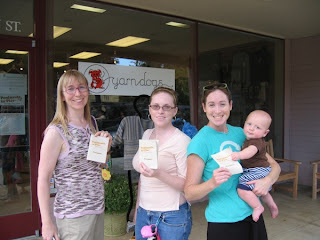 We started in Burlingame yesterday morning and ended today by visiting Yarndogs in Los Gatos. There are 18 yarn shops participating in the yarn hop. I don't think I will make it to the last two shops since they are all the way down in Pacific Grove and Carmel. If you get all 18 stamps then you will be entered in a drawing to win $500 worth of yarn at your favorite store. I am aiming for the 15 stamp mark so I can enter myself in the drawing to win $300 worth of yarn at my favorite shop. Tomorrow, Andrew will surf in Santa Cruz while I hit the three participating yarn shops down there. Blake has been such a trooper during all of this. He has logged no more than an hour of cumulative sleep time in the car and still smiles when he gets to the shops. I keep telling him that the madness is almost over. I have plans to crochet him some cute jammies once this is said and done. Keep your fingers crossed for the drawing.